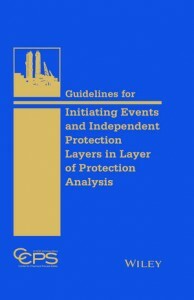 Hot on the heels of the previous 2014 update volume comes ‘Guidelines for Initiating Events and Independent Protection Layers in Layer of Protection Analysis‘ in 2015.
Credit can now be taken for non – return valves. There are many more initiating event frequencies e.g hose failures, etc. Many more PFDs for IPLs e.g explosion panels, restricted orifices, etc.